If you are feeling the frost of winter, you understand the comfort a dish can bring. This recipe is packed full of flavor! In a preheated large skillet add a drizzle of Olive Oil, then immediately add grated carrot, bell pepper, and shallot. Season with salt and pepper to taste, stirring until softened (around 4-6 minutes). Put into bowl and set aside, wipe out pan. Follow package directions on ravioli of your choice. 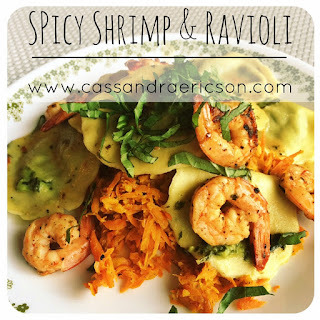 As soon as the ravioli gets dropped in the boiling water, add shrimp to preheated skillet, let the spices toast and shrimp sear, after 1-2 minutes add butter and toss shrimp until fully cooked (about 2-3 minutes per side if your pan was hot enough). Take shrimp out and set aside, leaving fond in pan. add another pat of butter along with dry sherry and 1/4 c of water season to taste, and let simmer until liquid reduces and ravioli is done. Drain ravioli well and add to sauce, tossing until coated.